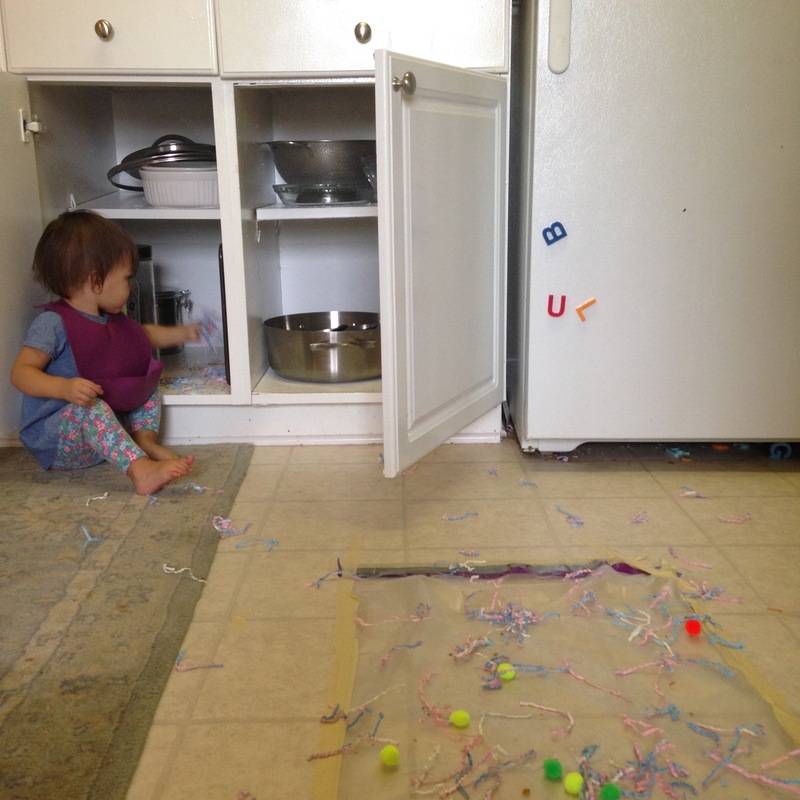 Lucy, Catalina and I have gotten into an informal routine of Messy Activity of the Day: a new activity to keep them occupied while I make dinner or try to finish my coffee before it gets cold. 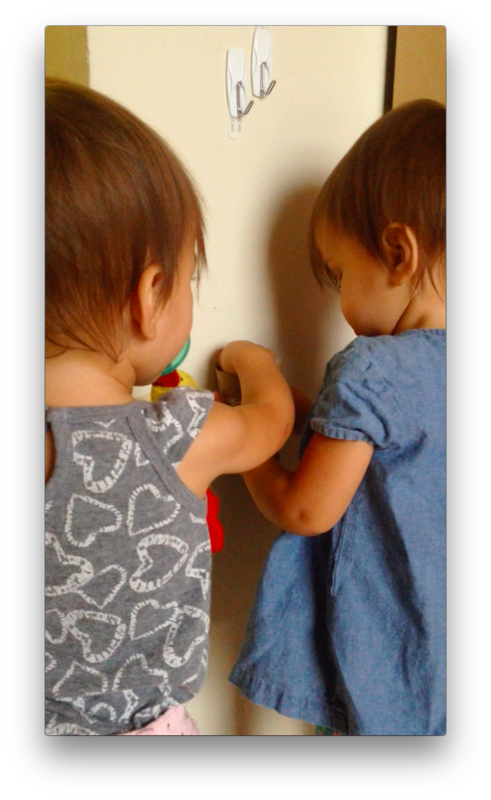 They are such active, curious little girls that it’s served us very well. The cleanup is a different story, but I promise being able to make dinner without holding at least one of them is worth it. And then there are the failures– like those Pinterest Fail pictures, toddler-activity style. Here are some we’ve loved… and some that just aren’t worth the mess. 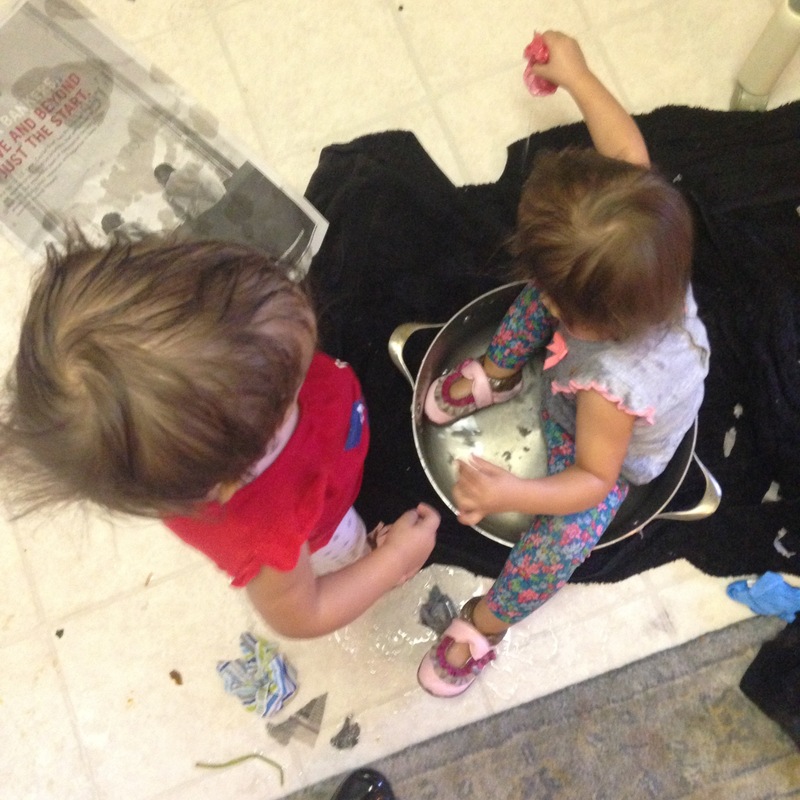 Pinterest version: “Cooking” with flour: Clean children contentedly stir flour in mixing bowls without messes. Reality: Flour everywhere. But this kept them busy so long, stirring, moving flour between bowls, and sitting in the flour. I buy my flour in bulk, so I just grabbed some generous handfuls and put it on cookie sheets. Fun or Fail? Fun! I’ll just do it with a sheet down in the future, and have them cook naked to the diaper too, if their clothes miraculously happen to be clean. Pinterest version: Paper in water: The kids put paper into water, watching it change color and texture as it gets wet. Reality: Putting newspaper in water turned into sucking water and ink out of the paper, which turned into washing each other’s hair with the soaked newspaper, which turned into sitting fully clothed in the water, which turned into dumping the water out all over the floor. Fun or Fail? Fail. (A fun, very messy fail.) Give my children water and they will dump it out. Not pictured in this photo is that my kitchen floor was a lake by this point. Pinterest version: Contact paper taped (sticky side up) to the ground with pom poms, sequins & paper confetti to stick onto it. One blogger said her kids loved walking over the paper over and over, and when they finally got bored of that they spent forever sticking little crafty bits on. Reality: Unimpressed. They walked over it a few times then couldn’t care less that it was there, no matter how pretty the paper or pom poms I stuck on. Thanks for the activity, but I’d rather raid the cabinets. Pinterest version: Pom poms & toilet paper chutes: The kids drop the pom poms through the cardboard tubes taped to the wall, which are angled different ways and cut to different lengths to keep things interesting. Reality: They loved it. For about 60 seconds. Then they tore the tubes off the wall and stuck them back on till the tape wasn’t sticky anymore, at which point they cried for more tape. Repeat. Fun or fail? A bit of a fail for us, but maybe fun in a few months when they care more about how things work. Pinterest version: Hair gel & googly eyes or sequins in ziploc bags taped to the window: These are supposed to keep them entertained for a long time squishing the gel, poking & moving around the googly eyes, etc. Reality: I thought they’d like this one, but they didn’t care at all about any part of this craft. Once they couldn’t re-stick it to the window, they tossed it aside and moved on. I think I liked it more than they did! Fun or Fail? Definitely a fail. Reality: They loved threading the pipe cleaners through the holes, first in my double boiler and then everywhere they could find something that worked. Fun or Fail? Fun! It keeps them busy and is good for fine motor skills. Pinterest version: Sensory play with ice cubes– give them ice cubes in a bowl and have them discover the cold, the slipperyness, the melting, etc. Reality: They each grabbed an ice cube or two, cried, and threw them back in the bowl. The end. Another one I thought they’d enjoy that they didn’t. 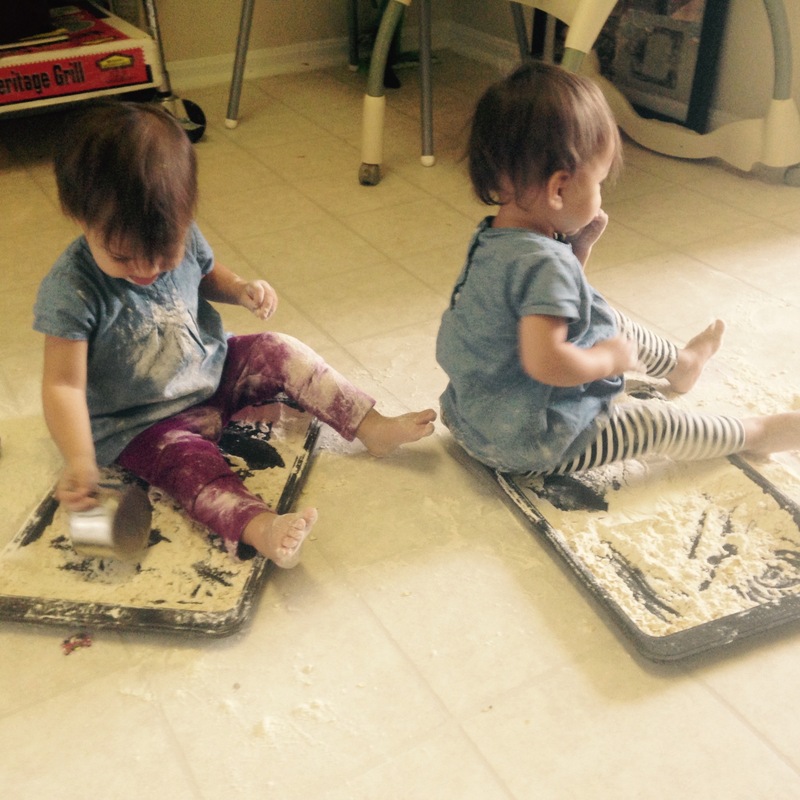 My children love anything messy. Pom poms! Just get pom poms. Lucy & Catalina’s current favorites are cooking with pom poms, putting pom poms in jars & then moving them between jars, and putting them in egg cartons. Really, pom poms never fail. What are some of your favorites? We’re on the lookout for more activities. One we haven’t done yet is washable paint in the bathtub– that one sounds really fun!